NEW! View photos from the McDonough Build. 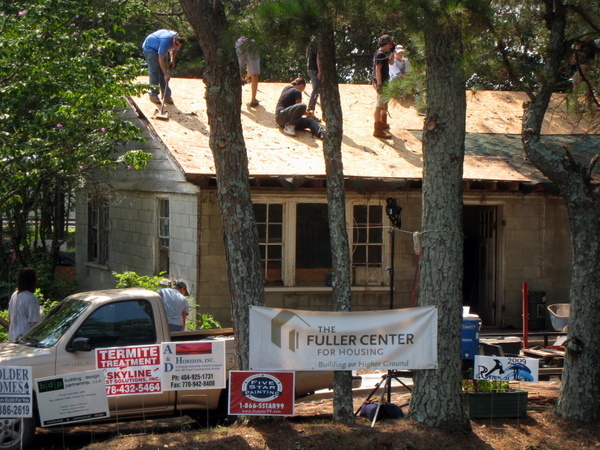 One-hundred and twelve student volunteers showed up again Friday for day two of a 17-house Fuller Center project – painting, roofing, landscaping and more for McDonough, Ga., residents, many in desperate need of home repair. One home was in such rough shape it became an “extreme renovation.” All 17 houses are part of the Lemon Place neighborhood in McDonough (near Atlanta) and each of the projects qualified for the Fuller Center’s Greater Blessing program. The Greater Blessing program allows for smaller-scale restorations to take place, without mortgages or loans. To read more about it click here. Christina Sheahan, 14, came with her youth group from The Orchard Church in Loganville, Ga. She’s worked on a home repair project before, but she was excited to find that this time, the homeowners worked right along with her group of students. The students came with a program called River of Life that organizes work camps for the youth from the United Methodist Churches in their region. Seven churches from northern Georgia and one from Alabama are in attendance along with many adult sponsors. Dorothea “Dot” Norman, Family Placement Chair for FCGA, went from door to door in McDonough asking residents if they could use some home repair. She said it took some convincing, but when word finally started to spread, more and more Lemon Place residents came forward with projects. “I can feel the difference in the neighborhood,” Norman said, looking around at the students laughing alongside local residents. Friday featured a lunchtime worship service where a few words of gratitude to the coordinators and volunteers were spoken by McDonough mayor, Billy Copeland, Fuller Center co-founder Linda Fuller, homeowner Alton Thomas and Reverend James Miller. The extreme renovation is taking place at the home of Lillie Miller. Miller’s home was infested with termites and didn’t have hot water. Walls, floors, and even the roof were starting to fall in, but she couldn’t afford the upkeep. “I had no idea it was in this bad of shape,” Miller said. She’s still not sure this is really happening. “Even though I see all this,” she said eying the 15-20 volunteers spread throughout the house, “I just can’t believe this is happening to me. “I never thought I’d have this much fun and still have my stomach churning on the inside, you know? It’s like riding a roller coaster,” Miller said.